Happiness is – a platter of homemade fried chicken! Oh boy I hope this post will not come across as cliché. This has been my thought as I pondered posting my recipe for fried chicken. 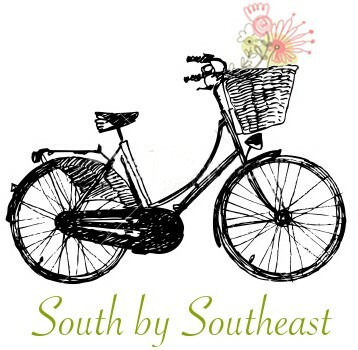 Yes, at the center of southbyse.com is the food and culture of the American south but do I really want to go there, straight to one of the most stereotypical southern foods of all time? I don’t think of fried chicken in that way, but most of the world (if they ever come across it) probably does. No one would dare accuse me of being a food snob, however when it comes to a few of my most beloved favorites then I will gladly admit to being biased. This goes for seafood (especially shrimp), tomatoes, peaches and fried chicken. I like my shrimp wild and local. I like my tomatoes ripened on the vine and local. I like my peaches to smell like peaches (not a vacuum bag) and if they sport a sticker it better be stamped ‘South Carolina’. And I like my fried chicken crisp, with the skin left on and local – preferably from my kitchen… or my Mama’s or someone else’s mama’s kitchen. Yes, I have eaten fried chicken from the Colonel and even from neighborhood grocery stores over the years, but there has never been any purchased fried chicken to match the chicken that was fried in my (or my mom’s) own cast iron skillet. In childhood, we ate fried chicken about twice a month, maybe a little more during the winter and a little less in the summer. It was on the Sunday dinner (lunch) rotation along with pot roast, roast chicken, and ham. Sometimes we would have it during the week as well, with sides of fresh vegetables, rice or homemade potato salad. 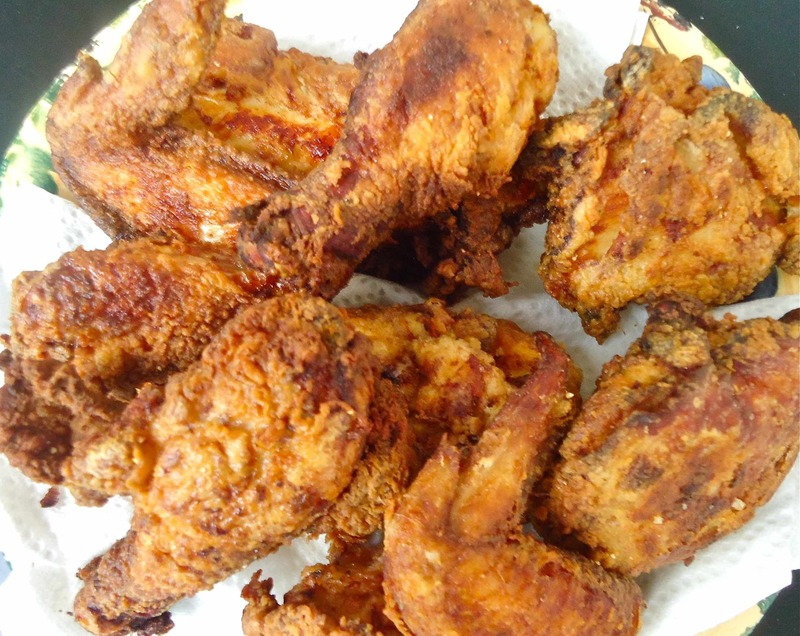 Thinking about delicious homemade fried chicken makes my mouth water, much like the smell of smoking barbeque pork, and it conjures up warm feelings and memories that I associate with that food. Dreaming about biting into that first taste of crispy, juicy chicken transports me back to my Mom’s small kitchen in Columbia, SC, with my Dad watching a baseball game in the den and my mother hollering for my brother to “come in and get washed up, ‘cause dinner was fixin’ to be ready!” It makes me feel good inside…plus it’s just plain delicious. Truthfully frying chicken can be somewhat messy – sticky chicken pieces, flour covered work surface and cleaning up that grease. If you’re doing it right, then hot oil will splatter across the range top. That fried oil odor may hang on for a while too. However, if you have a good ventilation fan it’s not much of a problem. Be sure to eject all small chicken and pets from the frying area– it can be hazardous for small ones. Used flour bags work great for tossing the chicken pieces and seasoned flour; it keeps any flour dispersion to a minimum too. Unless I have some kind of insatiable craving for fried chicken, I’ll make it when there’s a crowd to feed – like a potluck picnic or wait for it…tailgating. Today’s tailgater may be expecting something grilled or perhaps smoked, but my traditional football tailgating spread must include fried chicken. Even if you’re traveling for the game, just pack the fresh, hot fried chicken tightly in an insulated container and you’re good. Heck better to serve cold homemade fried chicken than none at all – that would be sad, and probably bad luck. 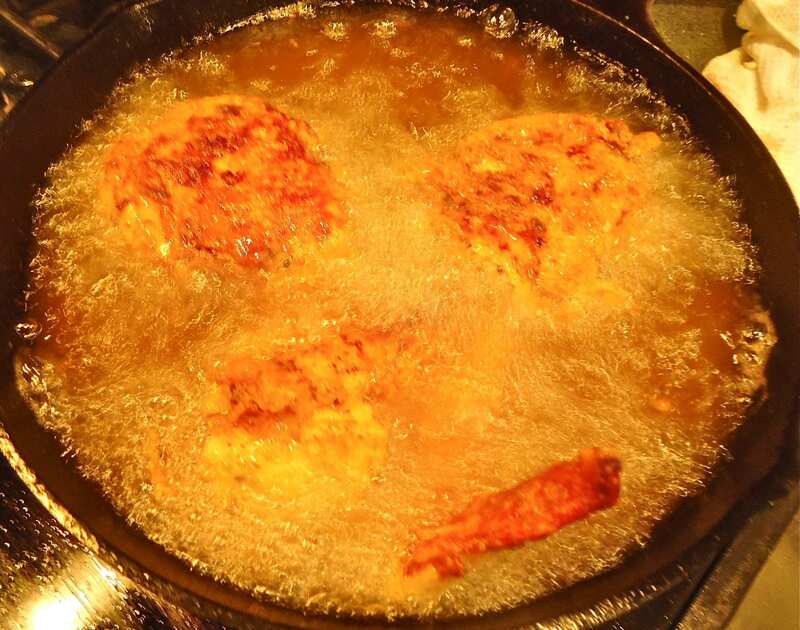 Make people happy… cook up some fried chicken! I skipped showing the ingredients and mixing up the marinade but it’s a simple task. I highly recommend using homemade ranch dressing, i.e. I use Hidden Valley Ranch mix and fresh low fat buttermilk. Turn the chicken over a couple of times throughout the marinating time so each piece is soaked well. Having the right equipment is important in frying chicken to ensure good results and safety too. Like the coal miner’s daughter Loretta Lynn (remember those commercials?) I prefer Wesson Oil for frying chicken. Leave ample space between the oil and the top of the pan, but you will need 1/2 inch of oil in the skillet. I save my used flour bags for frying chicken. One of these bags will work great for 8-10 pieces of chicken, then you may need to use a “new” bag. The flour, salt and pepper goes into the bag. I test my oil by throwing in a pinch of flour. If it sizzles it is ready for chicken. If it just sinks and/or slowly fizzles it’s not hot enough. If it’s smoking it is too hot so turn down the heat asap. 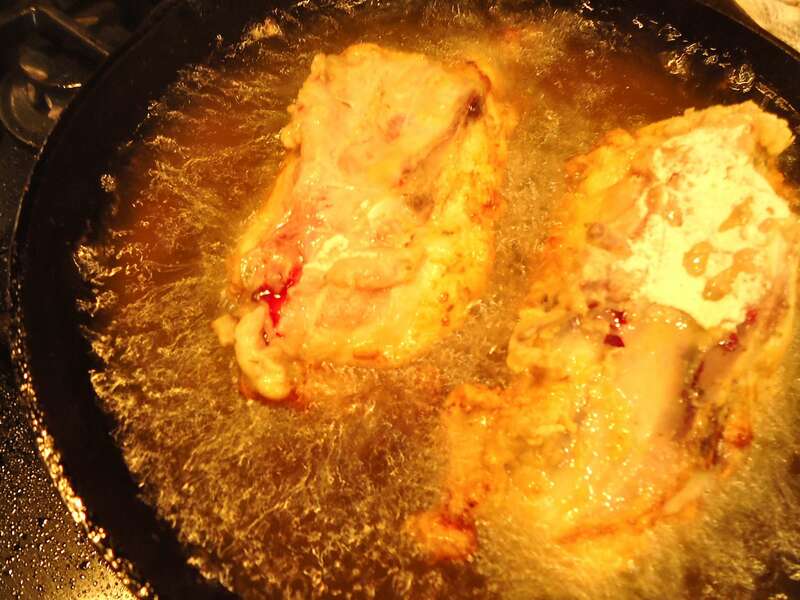 Here the first 2 pieces (breasts) go into the hot oil. You can see the frying in this image and that the oil is near the top of the pan, but not going over it. That would be incredibly dangerous so be careful. I find that when oil is 1/2 inch deep it is perfect for cooking half way up the largest chicken pieces – you only want to turn the chicken over once. Here is the next batch and you can see the wing portion. I fry my wings down side first (so the wing tip is down) which allows more even cooking of this piece. If you do the opposite it is impossible to get the whole wing to lay flat and cook evenly. Here you can see that blood is seeping up from the chicken. This is good – it means the chicken is almost ready to turn over to the other side. For large pieces like this breast, I let it go another two minutes or so after the blood appears before turning. The chicken has been turned over and is just about ready for the platter! I guess you can go home again, at least I can, with this meal! 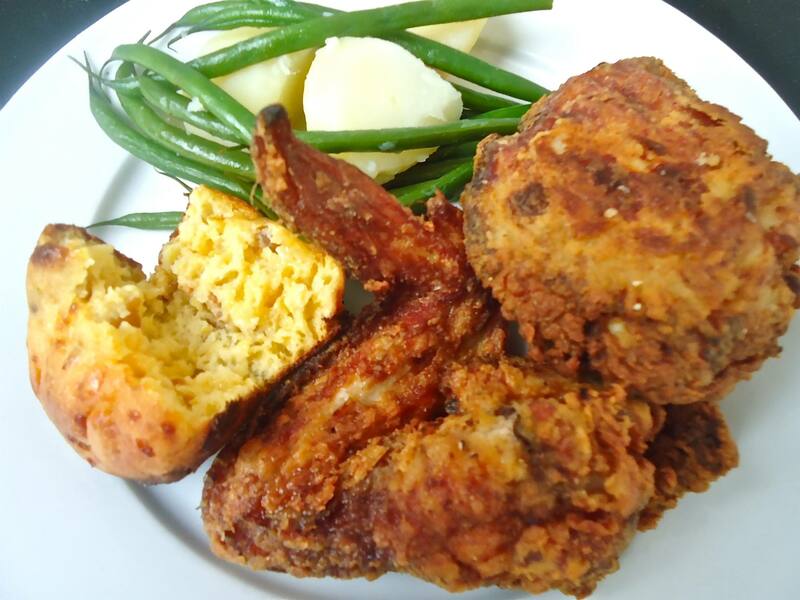 This is similar to a meal my own mother would serve when I was child: hot fried chicken, fresh steamed green beans with potatoes and homemade savory muffins. Mix dressing, milk and Montreal chicken seasoning in a bowl. Wash and dry chicken pieces careful to not contaminate surfaces. 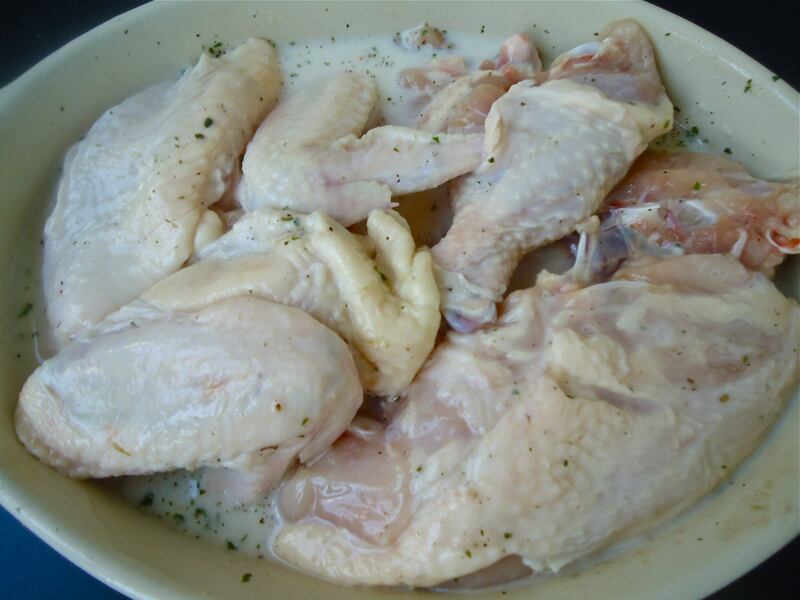 Place chicken in a large container or resealable jumbo-size bag and pour the dressing mixture over. Be sure it coats all the chicken. Place in refrigerator to marinate at least 4 hours and up to 8 hours. You may want to flip the bag or mixture over a couple of times throughout this marinating time. When ready to fry the chicken, prepare a paper towel covered platter and have tongs available. Take chicken out of the refrigerator and set aside. 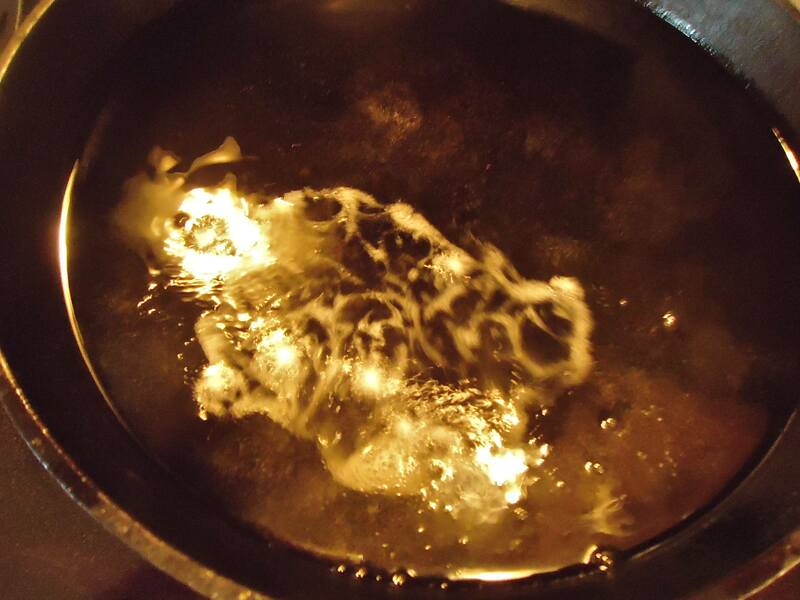 Heat oil in a deep, heavy frying pan, preferably a seasoned cast iron pan. 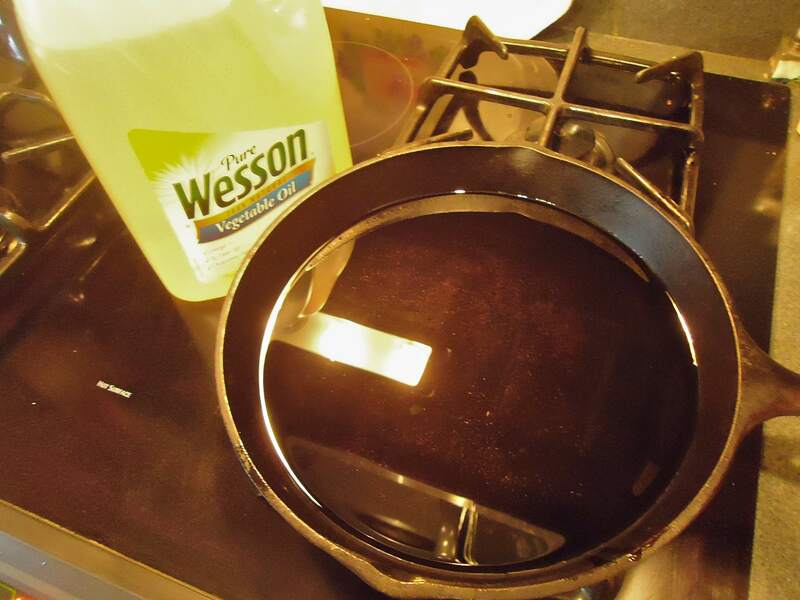 Pour oil ½ inch deep (or deeper) just so that there is at least 1 inch of space between the oil and the top of the pan. This is very important in keeping the pan from overflowing. 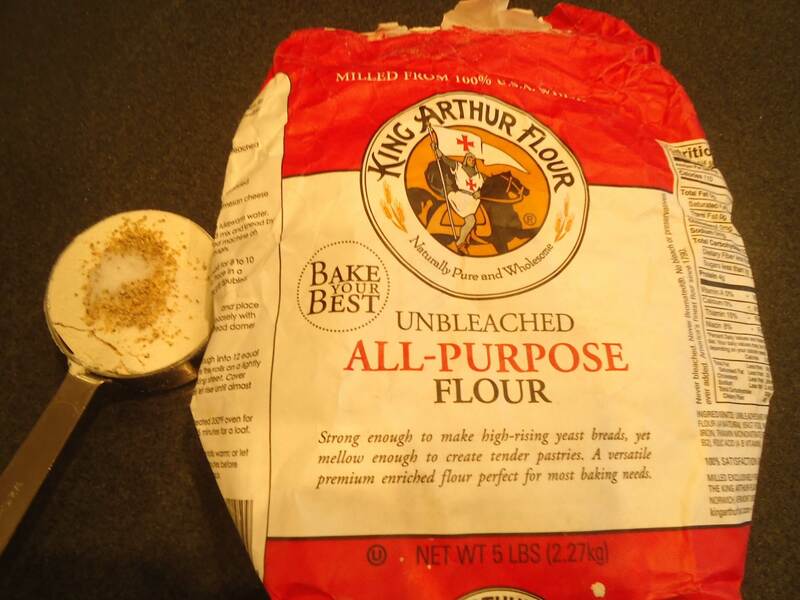 In a large bag or shallow bowl, stir the flour with salt and pepper. Begin heating oil until it is very hot but not smoking. Test with a pinch of flour – if it sizzles immediately, then the oil is hot enough. Dredge 2 or 3 pieces of chicken in the flour mixture so they are well coated, shaking off any excess flour. 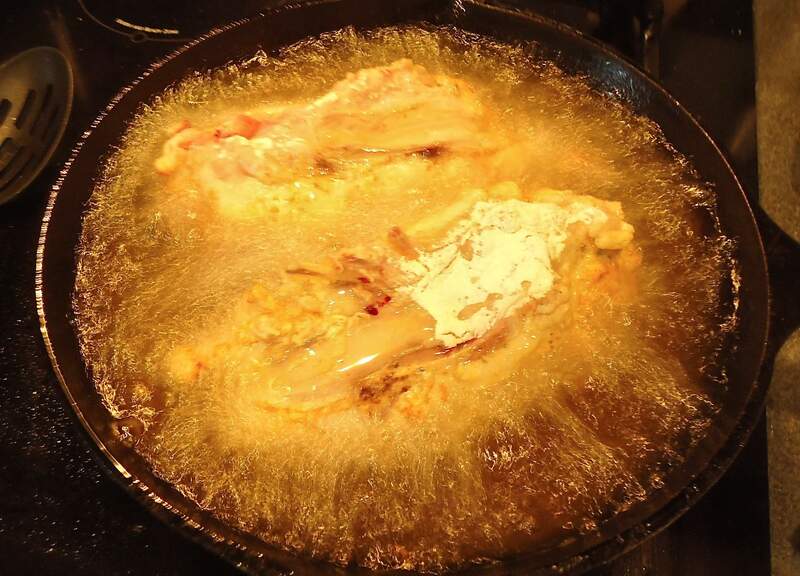 Carefully lay each piece of chicken in the hot oil. Do not crowd the chicken in the pan. The chicken will be ready to turn over in 5-8 minutes depending on which pieces you are frying. If blood is beginning to draw from the bone and you can see it, it is almost ready to turn over. Allow to fry a minute or two more and turn over. Fry on the other side and remove to the prepared platter. 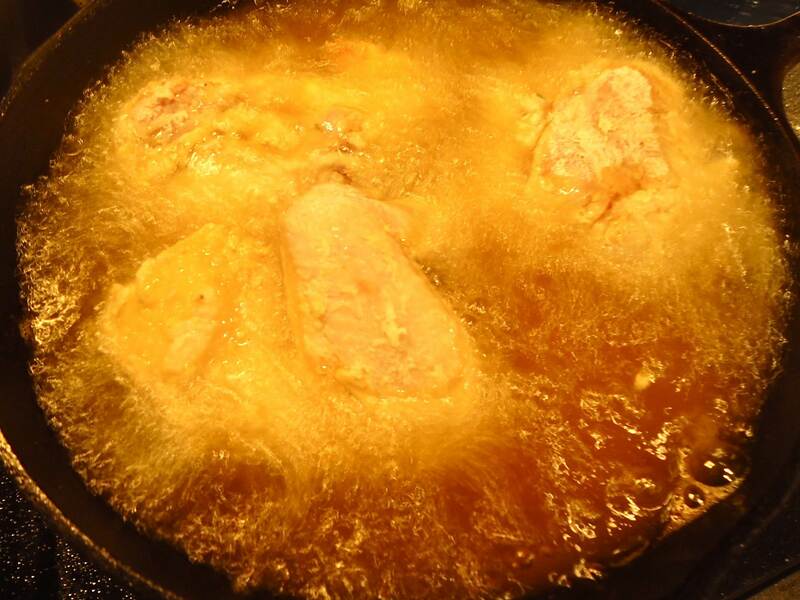 Allow the oil in the pan to reach the proper heat again before adding the next batch of chicken. Repeat & then eat! Serves 4. Double or triple this recipe as desired. If there is one thing always to be found in my refrigerator it’s a jar of bead and butter pickles. Of course, I am particular to my own pickles or my Mothers and store-bought really will not do at all. These sweet and tangy pickles are the first thing I learned to “put up” and I remember vividly waking up to the aroma of vinegar, onions and tumeric wafting through our house on a summer Saturday morning. It makes my mouth pucker up just thinking about it. But it also makes me smile, reflecting on how familiar that smell is and how I knew exactly what was happening and what was going to come to pass later that day. The pickle production line – gurgling pots and steaming jars. My mother announcing that all dogs and small children must stay out of the kitchen, which meant our Pekepoo mix, Pepper, and my brother. I was usually allowed to watch the proceedings IF I was quiet and not under foot. I may even be allowed to hold the funnel over the jars with potholder-covered hands. In the least I would get to “test” the filled jars for a seal – the popping sound snapping back at me as I dutifully pressed and checked the lids like a Vlasic quality control inspector. Over the years I have found the value of homemade bread and butter pickles to be incalculable. 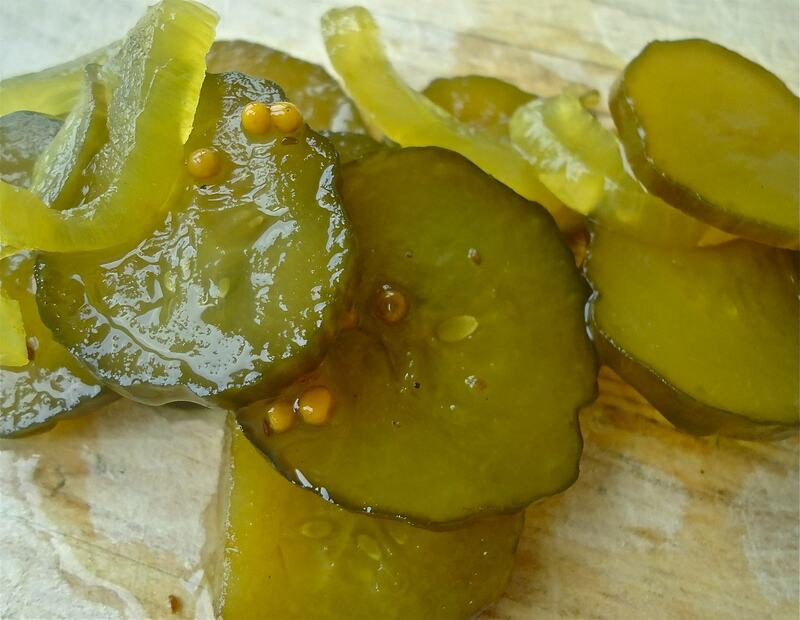 The actual pickles, the onions and the juice have made their way into so many other favorite recipes, which surely would be far less enjoyable without the tart-n-tangy pickle. From deviled eggs to curry chicken salad to pimento cheese and yes, barbeque sauce (! 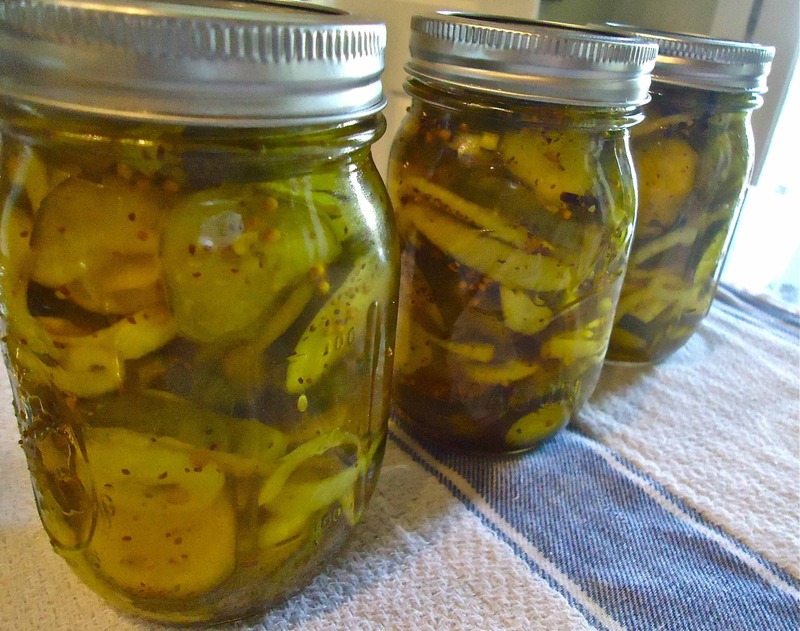 ), a jar of bread and butter pickles is the MacGyver of the kitchen pantry – but without all those pesky explosions. My mother usually makes her bread and butter pickles sans the overnight lime soak. However, I adore the crispness produced with this method so I find it worth the extra steps. 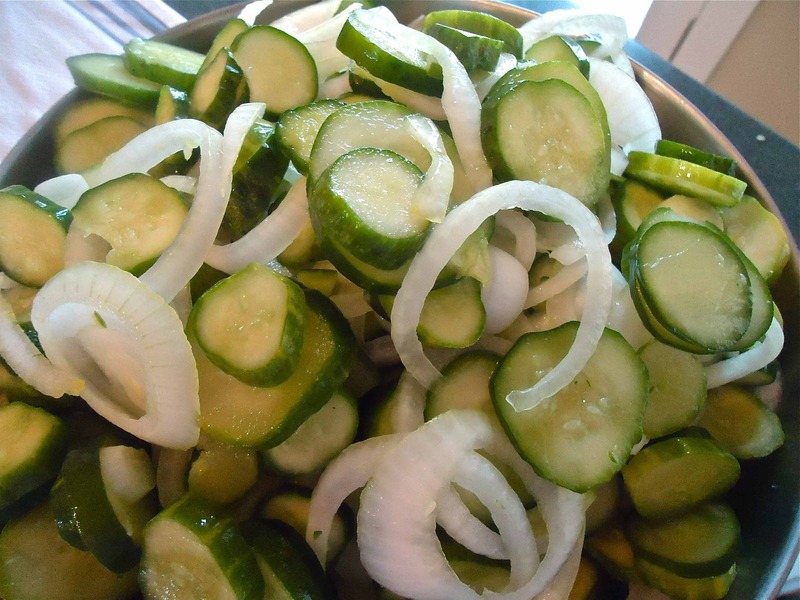 Another difference is the thickness of the cucumber slices – my Mama always slices them paper thin, but I prefer a heftier portion per slice. This year a request was made for more onions so I actually almost doubled up on sweet onion – they are great on sandwiches. 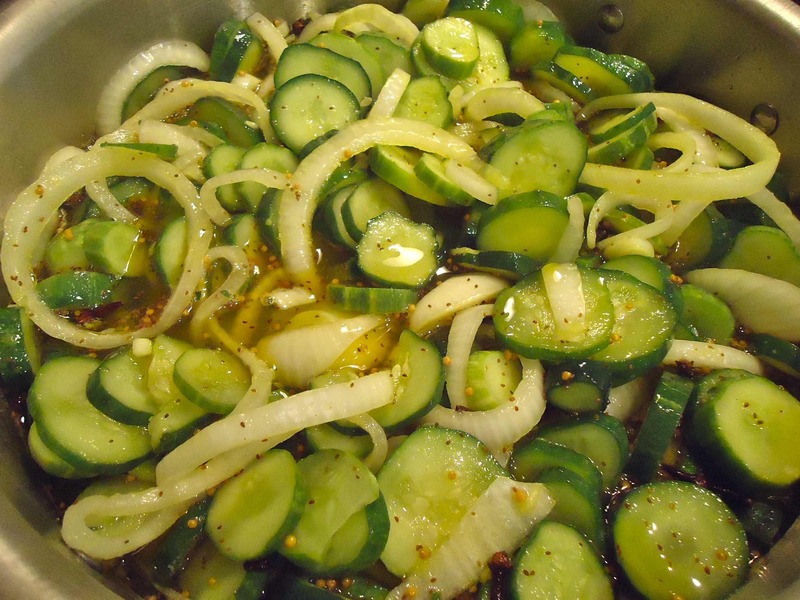 Chop them up with some pickle slices and voilà, relish. MacGyver should be so resourceful! A look at the finished product – a little inspiration to start. These cucumbers are about to become pickles, well, in about a day. Here’s a slice to show the thickness. Of course, you can slice the pickles thicker or thinner, your preference. Mix the lime into the water. Note that the lime will not completely dissolve. 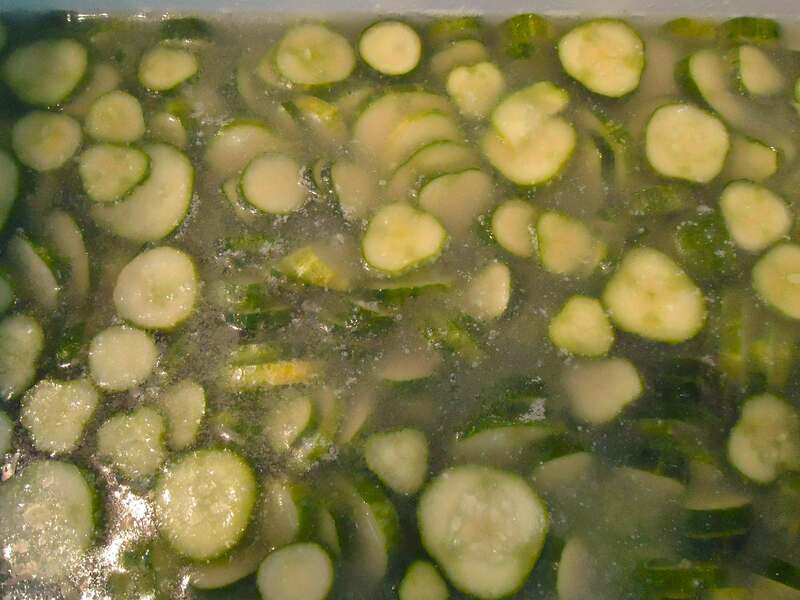 The cucumbers need to soak in their lime “bath” overnight or up to 24 hours. This batch soaked for 18 hours. 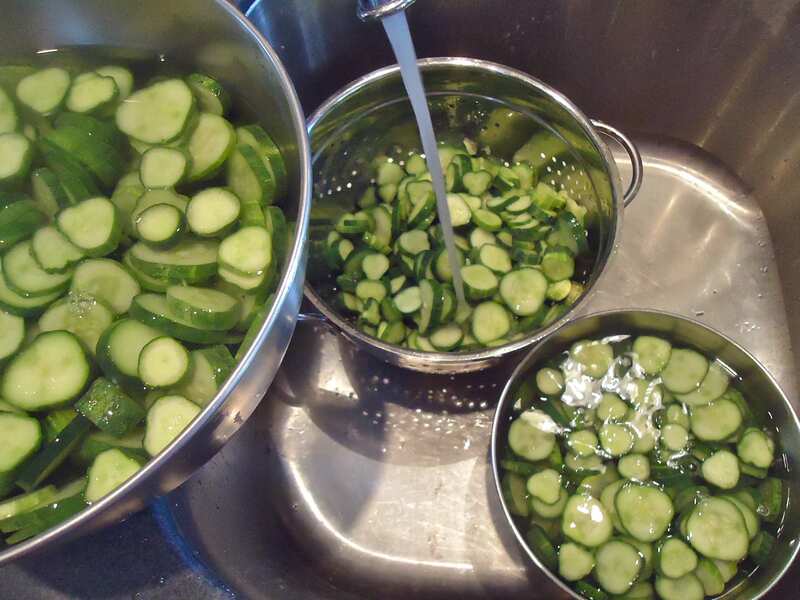 The lime must be washed off the cucumbers completely so rinse them 3 times. I washed them in batches. The next step is to layer the cucumbers, onions, kosher salt and ice and allow to sit for 3 hours. After their 3 hour cruise, errr… I mean ‘soak”, we are ready to finally get to the actual ‘pickling’. 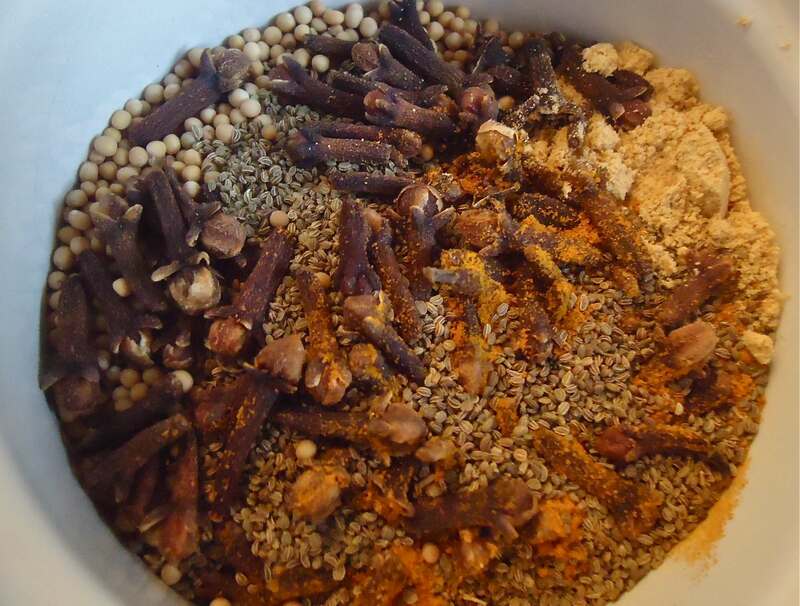 Here are the pickling spices. You can mix them individually into the syrup or mix them together and then add to the syrup, which is what I do here. 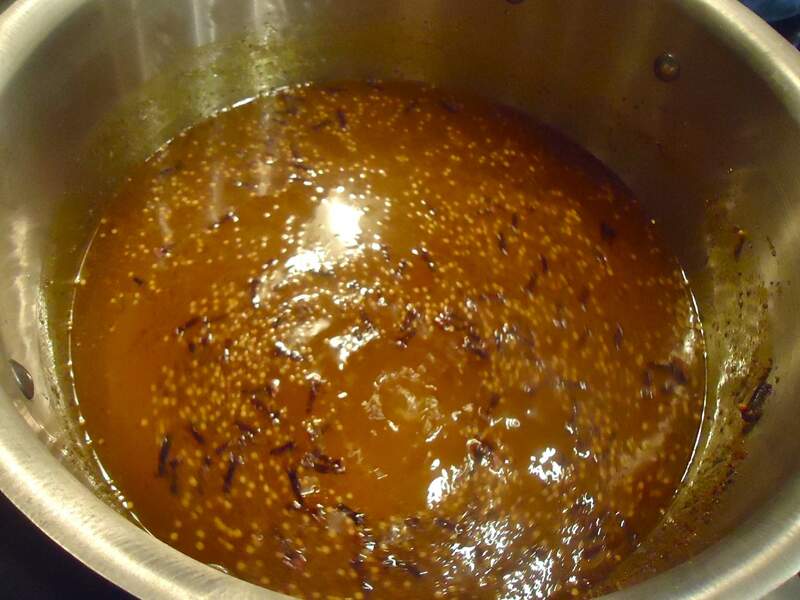 Mix the spices into the sugar/vinegar syrup and bring to a boil. Add the cucumber/onion mixture to the spiced syrup and bring back to a boil. Stir but try not to smash and break up the pickles. Meanwhile, the canning jars (and the lids and rings) should be boiling away in their hot water bath. Be careful lifting the jars from the hot water – use long tongs and/or jar lifters plus have lots of potholders and dish towels available. Like my Mama said, little kids and pets should not be underfoot while canning. Hot jars ready to be filled. Add the pickle mixture to the hot jars. Wipe any spilled syrup or juice from the rim of the jar and top with a sterilized lid. Secure with a ring using a potholder or dish towel to hold the hot jar. Wait at least a couple of days before diving into your pickles. 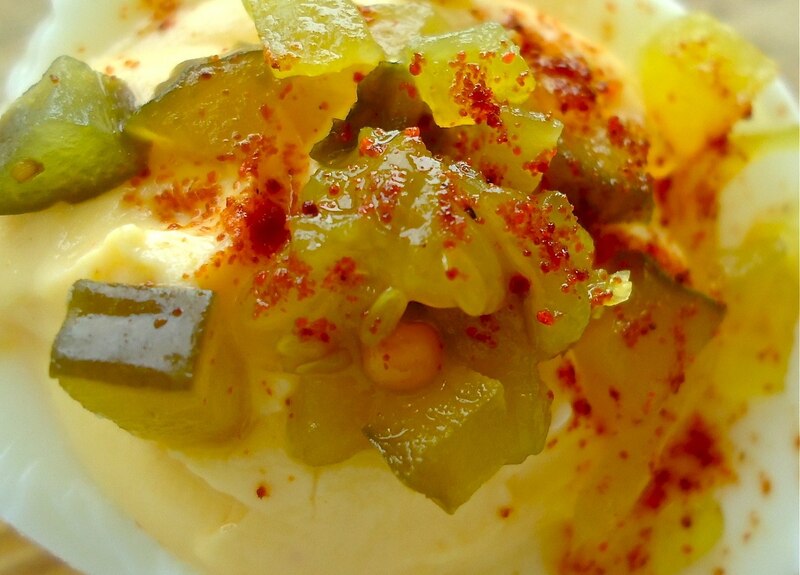 I like to top my deviled eggs with diced bread and butter pickles and a bit of pickled onion, of course! 8-10 lbs. small Kirby or “pickling” cucumbers, washed. Begin the day before you plan to can the pickles. 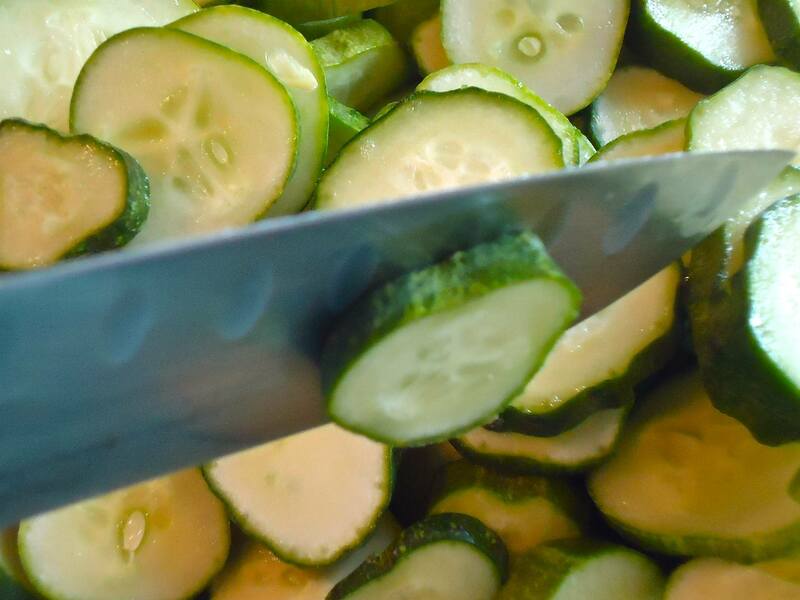 Slice the cucumbers between 1/8 and ¼ inch thick discarding the end pieces. Mix the pickling lime into the gallon of water. The lime will not completely dissolve in the water. In a large, clean non-reactive (plastic, glass, stainless steel or porcelain – NO aluminum!) mix the cucumbers with the lime/water. Stir and cover. Allow to sit in a cool area overnight and up to 24 hours. Stir once or twice during this time. 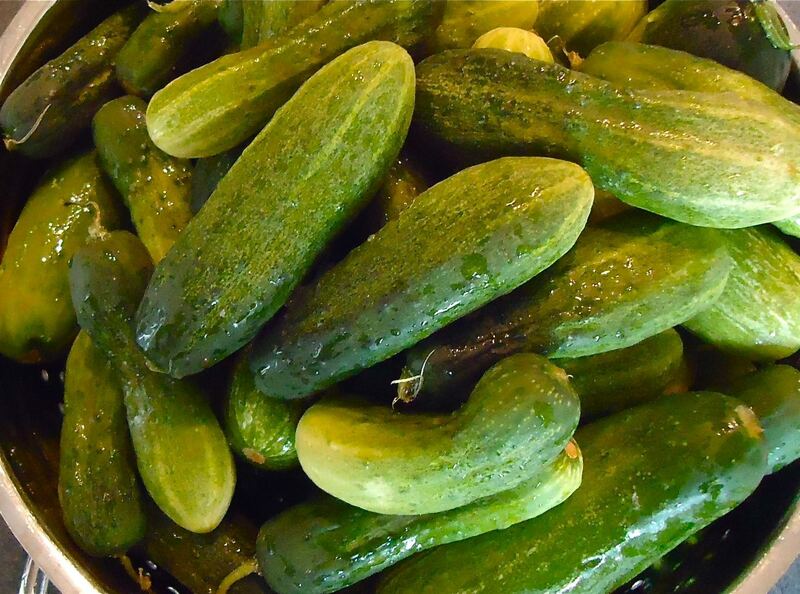 Drain cucumbers and rinse in clean water thoroughly 3 times to remove all lime residue. 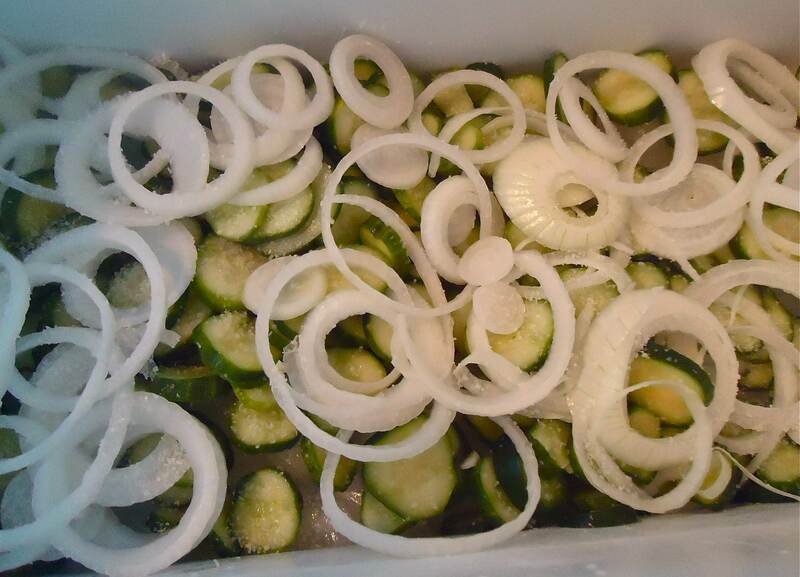 In a large non-reactive container layer the cucumbers, onions, salt and ice. I divide everything by three and layer in thirds. Cover and allow to sit for 3 hours. 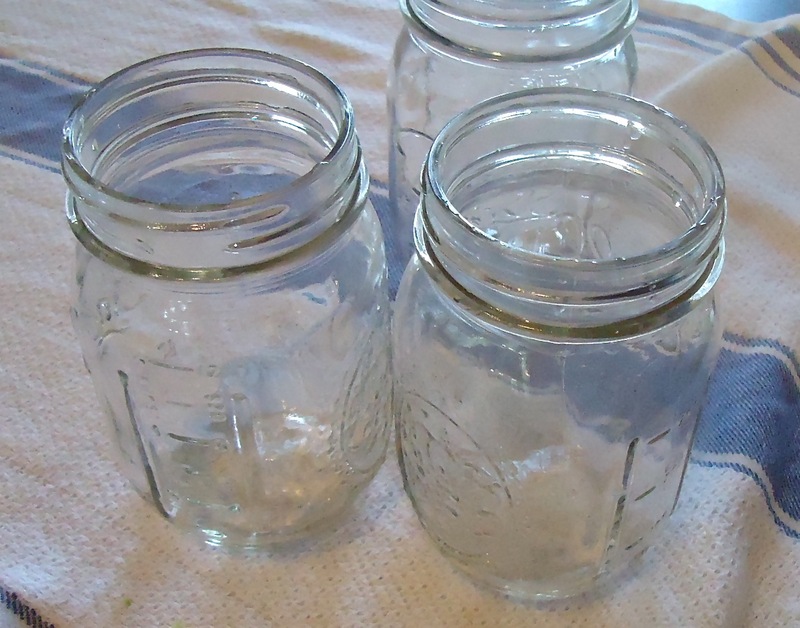 Meanwhile *wash the canning jars, new lids and rings and set up for sterilizing the jars. 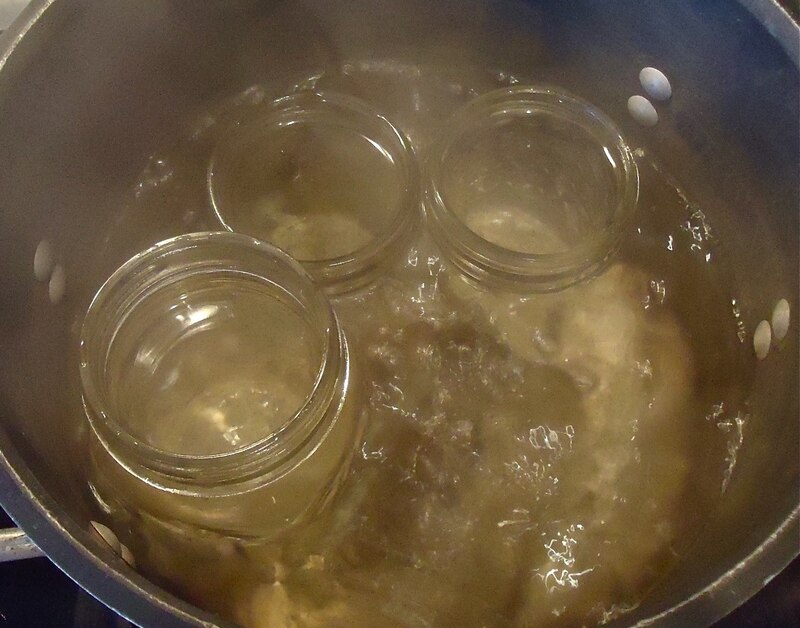 In a large pot (or canning pot) heat clean water to boiling– enough to cover several jars when submerged – add 3 or 4 washed jars, bring to a boil and reduce heat to simmer. In a smaller saucepan heat clean water to boiling and add the new washed lids and rings. Reduce heat to just below boiling- keep them hot. After 3 hours drain the cucumber/onion mixture. Do not rinse but discard any remaining ice. In a large non-reactive pot mix the vinegar and the sugar and begin heating. Stir to dissolve the sugar and add the spices. Bring to a boil and add the cucumbers/onions. Mix gently to evenly saturate the mixture in the syrup. Bring back up to a boil and stir. Reduce heat to a simmer. Begin canning the pickles. Carefully remove hot jars from the hot water bath. Fill each jar to within ½ inch of the top of the jar. Wipe away any excess syrup from the moth of the jar with a clean towel. Place a hot, sterilized lid on top and secure with a ring. Use a hot pad or towel to hold the jar while you screw on the lid as it will be hot. Continue to can all the pickles, adding clean jars to the sterilized water and keeping the pickle mixture hot. I can about 3 or 4 jars at a time. Some people do another step whereas they put the sealed jars back into another hot water bath, bring to a boil, remove and allow to cool. Since I use new lids every time and always check that a seal has been made on each jar I do not do this step. However, you do need to check that a seal has been made for each jar. To do this, lightly push on the top center of each jar after it has been filled for at least 15 minutes. If the lid pops up with your touch, it isn’t sealed and if it doesn’t, it has been sealed. If it has not sealed, check back after another 20-30 minutes. 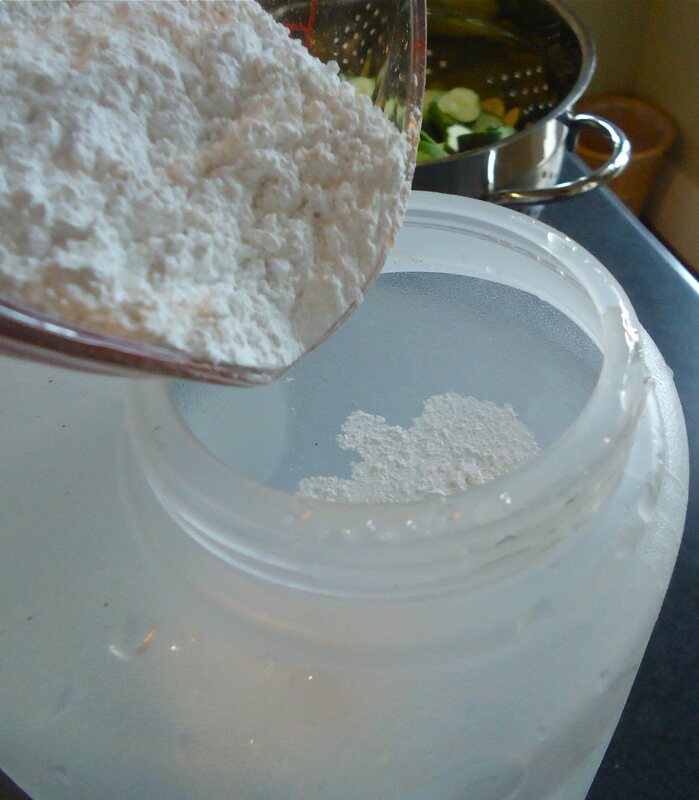 If after 1 hour a jar and lid have not sealed, you will need to replace the lid and seal and place the entire jar in a hot water bath (boiling water with water covering the entire jar) for 10-12 minutes. In all the years I have made preserves, jams and pickles I have never had to do this. Use quality jars and new lids. The rings and jars can be used many times over but new lids are the key to a proper seal. 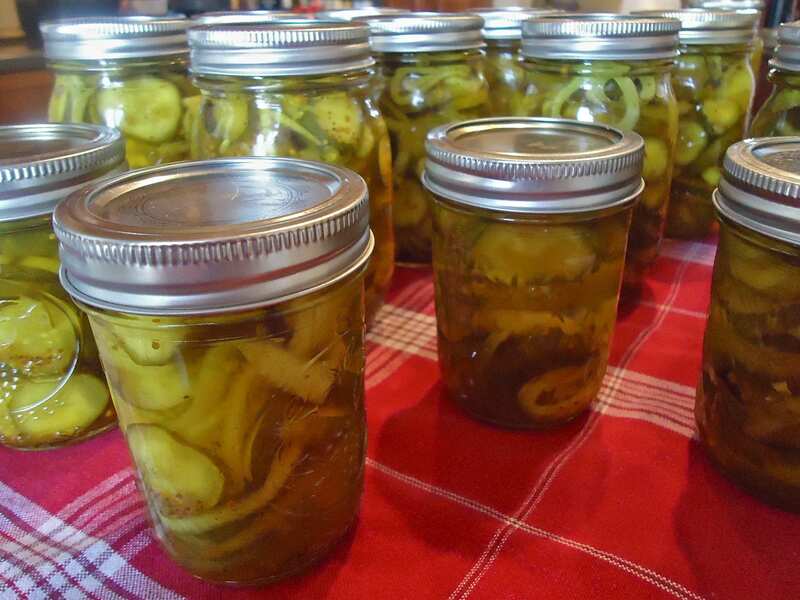 This recipe makes 12 pints of bread and butter pickles. Refrigerate after opening. * I wash my jars, lids and rings in the dishwasher on the hottest setting. I try to time this so that all will be clean, rinsed and still hot when I place them in the sterilizing hot water bath.